The plant toxin sickens livestock and can also make humans and pets fall ill. 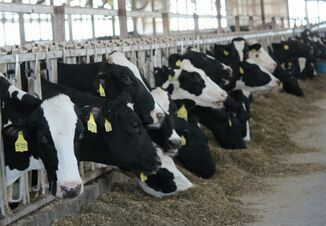 The appearance of vomitoxin and other toxins produced by fungi is affecting ethanol markets and prompting grain processors to seek alternative sources of feed supplies. Researchers at the U.S. Department of Agriculture first isolated the toxin in 1973 after an unusually wet winter in the Midwest. The compound was given what researchers described as the “trivial name” vomitoxin because pigs were refusing to eat the infected corn or vomiting after consuming it. The U.S. Corn Belt had earlier outbreaks of infection from the toxin in 1966 and 1928. A vessel carrying a shipment of corn from Paraguay is due next month at a North Carolina port used by Smithfield Foods Inc, the world's largest pork producer. 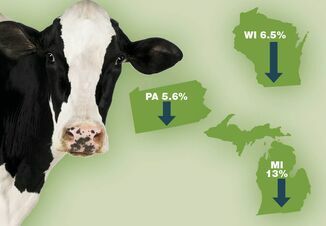 The spread of vomitoxin is concentrated in Indiana, Wisconsin, Ohio, and parts of Iowa and Michigan, and its full impact is not yet known, according to state officials and data gathered by food testing firm Neogen Corp. In Indiana, 40 of 92 counties had at least one load of corn harvested last fall that has tested positive for vomitoxin, according to the Office of Indiana State Chemist's county survey. In 2015 and 2014, no more than four counties saw grain affected by the fungus. And in a "considerable" share of corn crops tested in Michigan, Wisconsin and Indiana since last fall's harvest, the vomitoxin levels have tested high enough to be considered too toxic for humans, pets, hogs, chickens and dairy cattle, according to public and private data compiled by Neogen. The company did not state what percent of each state's corn crop was tested. Smithfield would not confirm it had ordered the corn from Paraguay, but two independent grain trading sources said Smithfield was the likely buyer. 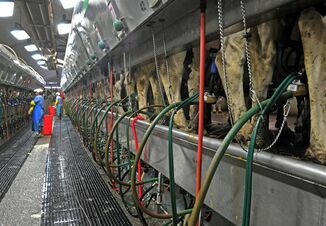 A company source said corn Smithfield has brought in from Indiana and Ohio, to feed pigs in North Carolina, has been "horrible quality” due to the presence of mycotoxins. The U.S. Food and Drug Administration allows vomitoxin levels of up to 1 part per million (ppm) in human and pet foods and recommends levels under 5 ppm in grain for hogs, 10 ppm for chickens and dairy cattle. Beef cattle can withstand toxin levels up to 30 ppm. Alltech Inc, a Kentucky-based feed supplement company, said 73 percent of feed samples it has tested this year have vomitoxin. The company analyzed samples sent by farmers whose animals have fallen ill.
"We know there is lots of bad corn out there, because corn byproducts keep getting worse," said Max Hawkins, a nutritionist with Alltech. Neogen, which sells grain testing supplies, reported a 29 percent jump in global sales for toxin tests - with strong demand for vomitoxin tests - in their fiscal third quarter, ending Feb. 28. "We're polling our customers and continually talking to them about the levels they're seeing. Those levels are not going down," said Pat Frasco, director of sales for Neogen's milling, grain and pet food business. The problem, stemming from heavy rain before and during the 2016 harvest, prompted farmers to store wet grain, said farmers, ethanol makers and grain inspectors. The issue was compounded by farmers and grain elevators storing corn on the ground and other improvised spaces, sometimes covering the grain piles with plastic tarps. Grain buyers say they will have a clearer picture of the problem later this spring, as more farm-stored grain is moved to market. Iowa State University grain quality expert Charles Hurburgh said the sheer size of the harvest in 2016 – the largest in U.S. history – complicates the job of managing toxins in grain, especially in the core Midwest. "Mycotoxins are very hard to handle in high volume," he said. "You can't test every truckload, or if you do, you are only going to unload 20 trucks in a day.” By comparison, corn processors in Iowa unload 400 or more trucks a day. Ethanol makers already are feeling the impact. Turning corn into ethanol creates a byproduct called distillers dried grains (DDGs), which is sold as animal feed. With fuel prices low, the DDGs can boost profitability. But the refining process triples the concentration of mycotoxins, making the feed byproduct less attractive. DDG prices in Indiana fell to $92.50 per ton in February, the lowest since 2009, and now are selling for $97.50 per ton, according to USDA. Many ethanol plants are testing nearly every load of corn they receive for the presence of vomitoxin, said Indiana grain inspector Doug Titus, whose company has labs at The Andersons Inc, a grain handler, and energy company Valero Energy sites. The Andersons in a February call with analysts said vomitoxin has hurt results at three of its refineries in the eastern U.S. "That will be with us for some time," Andersons' chief executive Pat Bowe said. Missouri grain farmer Doug Roth, who put grain into storage after last year’s wet harvest, has seen a few loads of corn rejected by clients who make pet food after the grain tested positive for low levels of fumonisin, a type of mycotoxin. Roth said he paid to reroute the grain to livestock producers in Arkansas, who planned to blend it with unaffected grain in order to mitigate the effect of the toxins. "As long as this doesn’t become a widespread problem, we're all fine," said Roth, who said toxins have shown up in less than 1 percent of the grain loads he has sold. U.S. farmers with clean corn are reaping a price bump. A Cardinal Ethanol plant in Union City, Indiana, is offering grain sellers a 10-cent per bushel premium for corn with less than one-part-per-million (ppm) or less of vomitoxin in it, according to the company's website.